What am I even doing in Iceland in the dead of winter? I needed the right trip; tranquil, invitingly isolated, devoid of hullabaloo, all packaged with a magnificent landscape. Sun is down, frost is up. 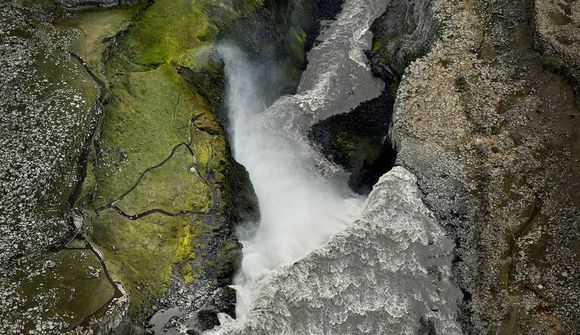 Such is Iceland. Approaching the exit door of the airport, the cold greets me. I’m in Iceland in the dead of winter. During the few feet I need to walk to my rental car the cold bites my cheeks and pricks at my thighs through the synthetic fabric of my pants. The frozen snow on the windshield is so hard I need to attack it three times with the scraper to be able to see through it. The seat in my fancy ride makes up for it by starting to warm up automatically, ahhhh... I install my GPS and check out the tablet that the traveling agency provided me with and has an app called Iceland Travel Companion that shows me my whole trip on a map. These guys better lead me the right way because I have no idea where I’m going. I drive through the dark, see some lights in the distance, but can’t really see anything. What am I even doing here? 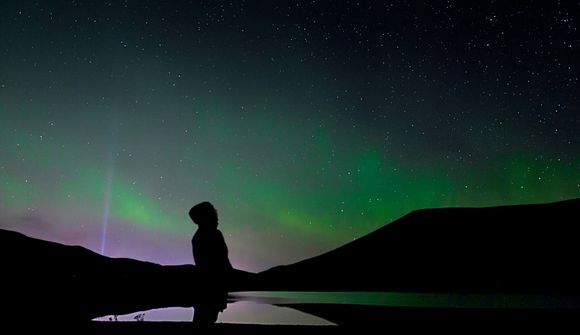 I sure needed to get away, I needed peace and quiet and Country Comfort and Northern Lights just sounded like the right trip; tranquil, invitingly isolated, devoid of hullabaloo, all packaged with a magnificent landscape. But so far I’m in a country I can’t see, and no sort of comfort seems to be on the horizon of this frozen land. Neither are the northern lights. We’ll see what happens. I drive in and out of Reykjavík in a few minutes and after more roundabouts than I have circled in my entire lifetime, I’m in the town of Mosfellsbær. 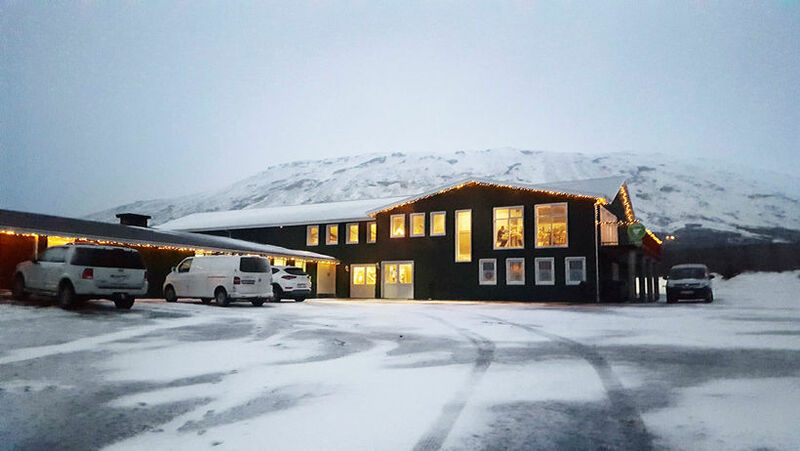 Hotel Laxnes is a cozy little place that used to be the farmstead that raised Iceland’s only Nobel Prize author and whose name he adopted; Halldór Kiljan Laxness. Now his picture hangs under a reindeer head in the bar area, amongst ancient skis, old paintings, little wooden ships, a stuffed fox and... stuff. Unlike the cold silence outside, the inside greets me with hot water running through the radiators in my room. Music to my ears. After a lamb burger and a glass of red wine at the local family restaurant I follow little Viking kids to the nearest ice cream parlor where they all have their dessert. It seems totally normal in this part of the world to enjoy an ice cream in the freezing cold, so I do too. Then, I crawl into bed with my Travel Companion App to see what tomorrow has in mind for me. My new friend suggests I visit Þingvellir National Park, where the oldest parliament in the world was founded. Fine. Then I just play around with the app following arrows and tapping on different colored dots and it shows me everything I can do on the road. Yay, I like this! – but there is so much to see and do… so I narrow it down to my interests... wow! No more bus trips with stops you can barely bring yourself to leave your seat for. Now I have the itinerary and my fun-filled tourist destiny in my own hands! Sunrise: 11.42 am. Sunset: 3.35 pm. 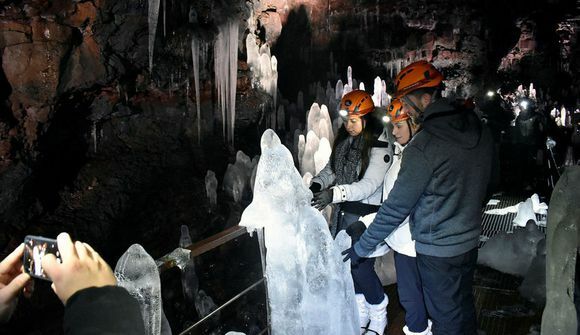 Temperature: 0°C. 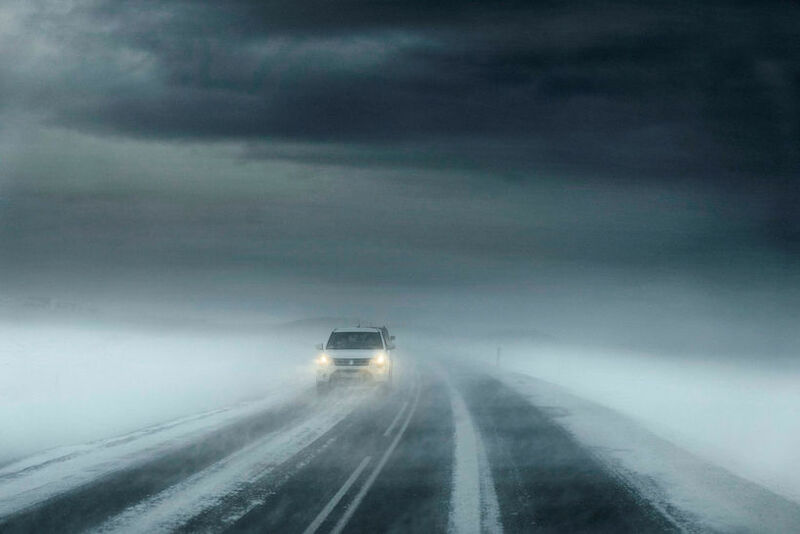 Road Condition: blue. Waking up under a deep dark blue sky, I go downstairs and get my belly full of fresh waffles and coffee. I wait for the sky to turn more of a lightblue to continue my trip. This time I want to be able to see this country. Meanwhile I check the weather forecast and the road conditions. In Iceland you need to know the color of your road. You want it to be green, which means it’s easily passable. If it’s orange it has spots of ice on it. Mine is blue; slippery. That it’s fine with me, as long as they don't get dark blue, which means very slippery. Also, it’s warmer today than yesterday. Does that maybe mean it’s slipperier? My new friend the Travel Companion informs me that the „scenic Mosfellsheiði heath“ will lead me to Þingvellir. Not very scenic today as I can hardly see anything. Which is actually the beauty of it. Some barren bushes in the distance, the road fifty feet ahead of me and behind me. Apart from that, nothing. Just whiteness, like the world had been wiped away. I take a deep breath and intensely enjoy this communion of myself and the nothingness of the world. Nothing to hear. Nothing to see. Total peace. This heath will be my favorite place on earth from now on. I want one in my neighborhood. At Þingvellir I walk down the Mid Atlantic Ridge where the North Atlantic and the Eurasian tectonic plates meet. I’m literally between two continents. Impressive! 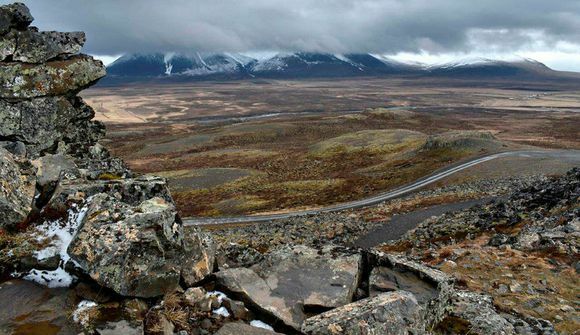 No wonder Þingvellir has been on UNESCO’s World Heritage List since 2004. A National Park since 1929. The nation’s parliament since 930. The place where Icelanders became Christian in the year 1000. My new friend the app knows his dates. Here all the Icelanders gathered for Althing which was a general assembly of the Icelandic Commonwealth. This was the main social event of the year and the place to be at the time. According to the number of tourists here, it still is. I contemplate the Law Rock upon which the most powerful leaders recited the country’s law by heart before dispensing justice. I just hope they were properly dressed. I’m well armed with an extra pair of mittens, hat and a big scarf from this charming wool factory store in Mosfellsbær, ready to confront the cold-hearted weather gods throwing sleet down at me. But I prefer my heated seat and head towards Laugarvatn or Hot Spring Lake where Icelanders have been bathing since medieval times. Maybe the Althing crowd went there too? 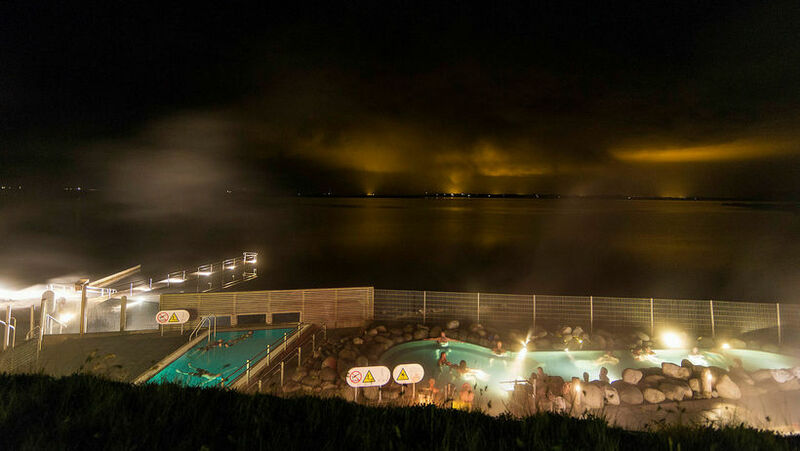 Fontana Spa is a very fancy Icelandic turf and lava building, basically built over a hot spring at Lake Laugavatn. I enter and walk right into a young blonde woman in knee high plastic boots and oversized winter coat holding a big shovel and an old pot. “Are you going on the geothermal rye bread baking tour?” she asks me, and how can I not? Back into the sleet. A group of tourists jumps out of a bus and joins us on our march to the beach of the lake, where we gather around a pebble in the black sand. Okay. The young lady thrusts the shovel into the ground and digs out a pot identical to the one she brought here. Just a foot into the sand and the water in it is boiling! What a brilliant way of cooking food! Back in the fancy building she slices the bread that looks like a huge chocolate cake. The melting butter leaks off it and right into my drooling mouth – and little bit down my chin... and even further. Time for a bath. The most singular bath I have ever had. It starts with me bathing naked in front of everybody. Then running out into the cold in a wet swimsuit. Squealing when I step on the sleet covered ground as it shoots needles up my feet. Escaping into a small wooden cabin full of steam where I heat up so quickly I think I'm going to faint. Muttering out loud to myself I realize that I’m not alone, I just couldn’t see anybody through the heavy steam rising from underneath the floor. I smile apologetically though no one can see, and leave. Cooling down I detect the lake and see people going in. I think I should rather try that than one of the mineral baths. Bad, painful idea. I retreat to the closest sauna I find and squeeze my chubby buttocks on a bench between two youngsters, who then start to chant. More youngsters enter and soon the sauna is full of chanting people. Where on earth am I? Releasing all tension and emptying my mind I start to chant along. Just when I feel as though I'm connecting with the gods, I feel the urge to leave. 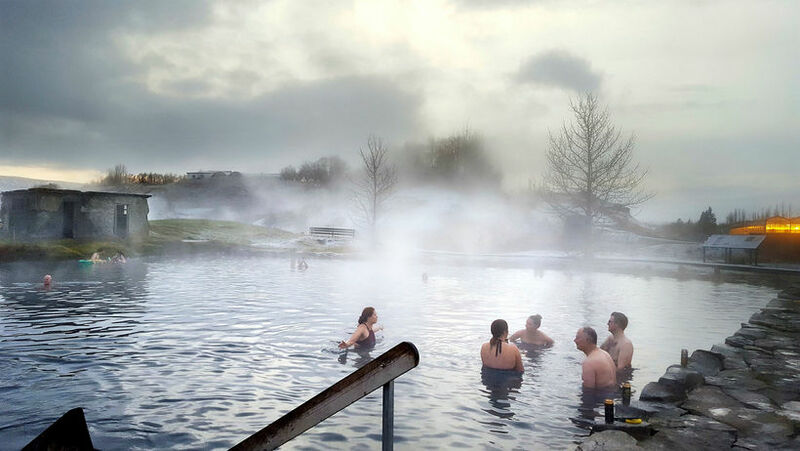 They say these natural bathing routines are thought to be healing and one of the the reasons for Icelanders' long lifespan. I believe it. I get it. I know it. I can feel it. Warm to the bone and feeling somewhat high I decide to meet Geysir, the most famous geyser in the world, that gave the English language the word for springs that occasionally shoot jets of hot water into the air. But I can’t. After a minute of walking towards the geothermal area I'm drenched and the freezing rain pricks my face so hard it’s unbearable. I flee inside this massive, fancy store that any Fifth Avenue could be proud of. Not what I'm looking for. I drive away in a terrible visibility and find my destination, Efsti-Dalur farm hotel, close by. Wet to the bone and shivering I get a carved wooden dog with a key attached to it that unlocks a little cabin. As I open the door the reassuring smell of heat encloses me. All Scandinavian wood not only floor to ceiling, but also floor and ceiling. I admire my little private furnished sauna and while I feel my face starts burning from my unsuccessful geyser adventure. Walking to dinner in the creaky snow this curious, not too pleasant smell grabs my nose. I remember I’m actually on a real farm with a huge cowshed. Above it is the restaurant The Barn Loft that serves food from farm to table - but the smell stays outside. The exquisite carpaccio (from local beef) and the succulent trout (that swam the river close by) glide gently down my throat. And of course ice cream, delicious homemade ice cream that I enjoy while watching the cows that produced the milk it was made from. The warmth of this place is palpable. There is respect for life and nature. Owned by the same family since the 18th century, the ambiance of the farm feels deep and rooted. It’s the home of the people that work there and they make their guests feel at home. I trot down to my little wooden haven and look at my new friend to see what tomorrow will bring me; Geysir, Gullfoss Waterfall and The Secret Lagoon. All good. Then I can choose from different fabulous museums and magnificent churches. But that’s not my trip. I don't need the cleverness of art or the stifling history of religion. Only the real deal; just nature, this ubiquitous presence of both hot and cold and me in the midst of it. No thinking, pondering, wondering or spectulating. Just being and feeling. Winter wonderland envelops the landscape. Beautiful! - but deadly, I find out when I feel the slipperiness lurking under the glittering cover. Carefully, I make my way to breakfast with the farmers of Efsti-Dalur: Uppermost Valley. Closest to God? They chat politics over a cup of coffee, organize the day. The sun is taking its time breaking through the clouds, doing a fine job coloring them with yellow and pink. Do I envy these people to start every day surrounded by such beauty? To have always lived in such a peaceful place? I just know I don't want to leave and the farm dog doesn't want me to either. He runs in front of my jeep, looking back at me. He gets out of the way right before I glide down the steep private drive back to the main road. In the rear-view mirror I see him wave good-bye. Finally, I get to see Gullfoss and Geysir, two of Iceland’s best known landmarks. They are the perfect representatives of the hot and cold that distinguish this country. 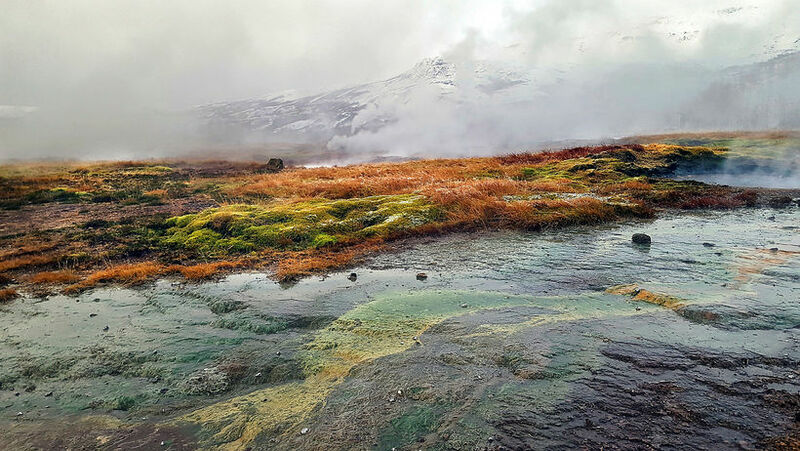 The hot springs peacefully refuse to accept the winter by melting the snow around it and bringing out bright green and other stunning colors in the nature. 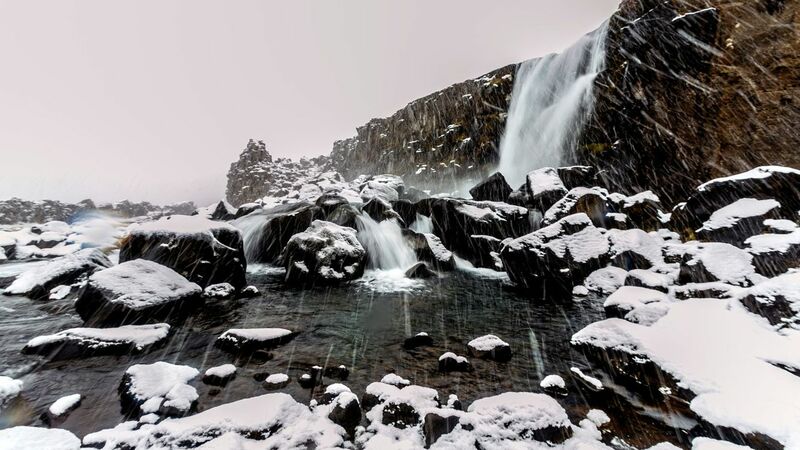 The icy waterfall on the other hand embraces winter. This awfully powerful force of nature, makes its merciless way threatening anybody who comes near it with stingy mist and giant icicles hanging from it. I’m not surprised to run into my old friend from the first day; the biting cold that right away starts nibbling on me, brrrrr... I hurry along to my next destination Friðheimar, which means literally Worlds of Peace. Huge, fluffy snowflakes glide slowly down the sky when I walk through a sparse forest towards a humongous greenhouse filled with only tomatoes, all kind of tomatoes, harvested in the most natural way. Inside people carry fairy-taleishly huge loaves of bread, I take a seat in the restaurant corner and allow water from the pipes to drop on my shoulder. I order the most expensive tomato soup I have ever purchased, but it’s worth every spoonful of it - and I can have seconds and a mountain of that warm home-baked bread. And to honor my latest culinary tradition I have ice cream for dessert. And what could anyone ask for more than tomato ice cream in a flowerpot? “What is so secretive about it?” I ask a guard at the Secret Pool, where I lean comfortably on a cliff close to a tiny deserted house. The guard walks leisurely around preventing people from getting into the burning-hot springs beside the pool. In Icelandic it’s called the Old Pool my new friend had told me, as it was made more than a century ago. “It’s the secret of the ghosts dwelling in these old changing cabins,” he nods towards the house. “The spirits of the people that have drowned here through the years.” Oops, not the answer I expected. Even though the guard grins, I get goose bumps and slowly swim away from him and that creepy little house. I let myself float around watching the blue sky and bumping into people. This is my last destination on this road trip. I smile to myself even though I feel like this country; both hot and cold. Happy about this experience, sad it’s over. I’m going to miss my daily ice cream, my new bathing routine, the kick of having heat and cold fight over me, miss engulfing myself in the emptiness and the plenitude of this crazy nature. I smile because this trip was just so perfect. I got exactly what I needed. With a little help from my friend.